Book signing and conversation: Henrik Nygren and JP Williams | P! Please join us for a dual book signing and conversation: JP Williams of Wms&Co. 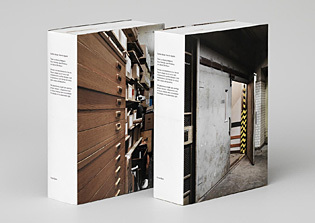 launches the limited edition book, A Designers Eye, a photographic essay of objects from the personal collection of Paul Rand, while Stockholm-based Henrik Nygren presents his recently-published monograph, Graphic Design: Henrik Nygren. Over the past two decades, Nygren has developed a remarkable body of work with institutions, galleries, artists, and publishers such as Beckmans College of Design, Birkhäuser, Färgfabriken, Hasselblad Centre, Moderna Museet, Phaidon, Serpentine Galleries, David Zwirner, and others. This recently-published 900 page volume showcases a rich sampling of his work and includes essays by Hedvig Hedqvist, Sara Teleman, Lars Forsberg , and Daniel Birnbaum.